The Chinese Gold Panda has been minted beginning with the year 1982 and since then has had a different design every year, fact that is even today a big attraction for collectors and investors. There was only one exception for the edition from 2001 which obviously has raised some protests amongst collectors therefore the Chinese Mint decided to return to the tradition that started 30 years ago. The Gold Panda is bullion gold coin that with his 99.90% fineness attracts many investors even from the 1980s. In China these gold coins have the status of legal tender being issued in denominations of 25, 100, 200, and 500 Yuan. These denominations correspond to an array of sizes in which are minted the Gold Panda coins: 1/20, 1/10, 1/4, 1/2 troy ounces of gold which are used in the jewelry industry in manufacturing beautiful and original pieces, and the 1 troy ounce of gold size which is used in the necklaces manufacturing. The corporation that makes available these Chinese coins illustrating a panda to interested people that desire to invest in gold is the China Gold Coin Corporation (CGCC) and in the United States the distributor is Panda America. Collectors all over the world were completely won over by the image of a panda on a gold coin and in time the Gold Panda has become a priced bullion gold coin which is sure to bring a profit from its premium, which increases in time. Collectors interested in acquiring these Chinese coins should be aware of the fact that they are minted at a higher price over the spot price of gold which becomes obvious when they are compared with other bullion coins. The Chinese collectors are encouraged by their government to invest in coins and gold in general and through the wonderful designs presented on the Gold Panda there are little persons that could resist to these coins which are found in Brilliant Uncirculated condition. Another thing that appeals to collectors is the limited mintage for the Gold Panda coins out of which some are used in the jewelry industry. Therefore, this is an obvious situation that increases their value. An example of how valuable a Panda coin can be is the fact that in 1987 there was sold a one troy ounce coin that was minted in 1982 for more than US$3,000. 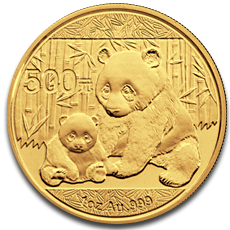 At the beginning of the article we have stated that the design for the Gold Panda coins changes every year, meaning that the reverse of these coins features a different depiction every year, of course with the exception of the issuing from 2001. The reverse of the Gold Panda coins depicts different portraits of adorable panda animals which give the name of these coins. This heart melting design of the endangered giant animals are accompanied by inscriptions regarding the fineness, the gold symbol, the size, and the denomination. The obverse of the Gold Panda coins illustrates the famous Temple of Heaven and when these coins are minted as commemorative ones, the commemorated event is also present on the obverse. The inscriptions found on the obverse of the Gold Panda coins are the year of minting and Zhonghua Renmin Gongheguo which translates as People’s Republic of China.